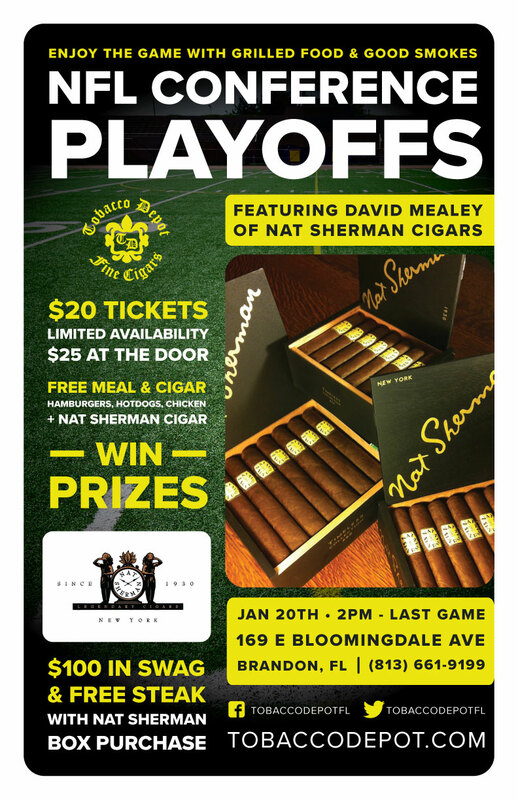 On Sunday January 20th from 2PM through the last game’s end we’ll be hanging out at Tobacco Depot Brandon with David Mealey from Nat Sherman Cigars. We’ll have hotdogs, hamburgers, and chicken on the grill for attendees. You’ll also get a complimentary Nat Sherman cigar to start the event off with. With the purchase of a Nat Sherman box, David will give you $100 in free Nat Sherman swag, plus a ribeye or strip steak cooked to your liking. We’ll have prizes for predicting the final score of the game. The event is $20 to attend if you buy your tickets in advance at the store, or $25 at the door. There are only limited tickets available, so get yours before they’re all gone.